Once you are logged in you will see a person icon at the top right of the page. Click on this icon to be routed to your “Dashboard”. At the top of your screen you will see “Dashboard Home”, “Favorites”, “Live Activities”, "Learning Center", and “Account”. Choose “Dashboard Home”. You’ve arrived at your Dashboard! From this Dashboard you can view all of the properties you have marked as your “Favorites” as well as all of your bidding activity under “Live Activities”. What’s a “Favorite”? You add a property to your “Favorites” by clicking on the heart at the top left of the property. 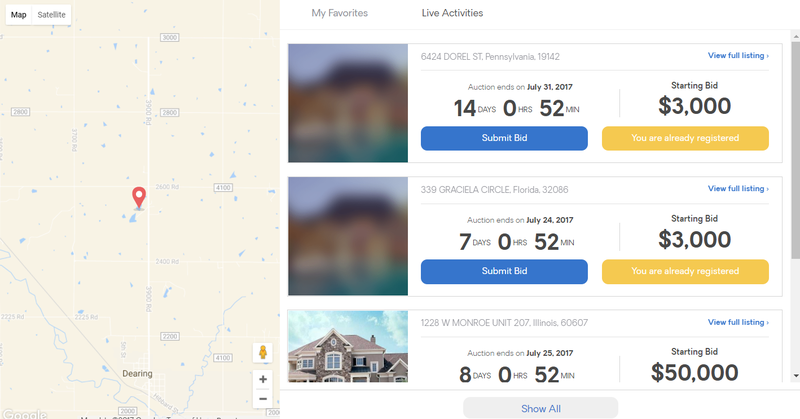 Properties get automatically added to your “Favorites” when you place a live bid, submit an online offer, or register for the auction. On your “My Favorites” tab you will see all up to date information regarding your properties of interest. In this view you can see what phase of auction the properties are in (pre-auction or in auction), the starting bid, auction information, and so on. You can submit offers on the “My Favorites” and “Live Activities” tab. Click on “Live Activities” and you will see all the properties you are currently bidding on. Watch all your bids LIVE in one place.